Home » Uterine Fibroid Articles » Videos » Cancer risk with a common surgery? Share the post "Cancer risk with a common surgery?" Pat: I’m here with Dr. Bruce McLucas who is founder of the Fibroid Treatment Collective in Beverly Hills. And we are here today to talk about a number of things. Its been a lot of news recently about something called a power morcellator and how that can affect people being treated for fibroids and uterine tumors. I mean there is a lot of confusion between fibroid tumors and cancerous uterine tumors, a lot of women are confused and a lot of women are dealing with these issues. And I know Dr. McLucas; you have answers about a lot of them. Dr. McLucas: The fibroids are benign. I mean they cause some terrible symptoms, but fibroids are benign growths, they are not cancerous, there are the cause of I’d say half a million hysterectomies, removing the uterus, removing the uterus, and myomectomies, leaving the uterus and cutting out the fibroids—every year. That’s a half million surgeries being done for fibroids and they’re almost always benign. Now in one tenth of 1% of women there is confusion. You start thinking that you are going to be dealing with that benign tumor and it turns out that it is a sarcoma—it’s a cancer. The problem Pat is that we have no specific test that can tell us before we start to do a surgery, we’ll get to this later in the interview, but there is no specific x-ray, there’s no ultrasound, there’s no pelvic MRI, there’s no CT scan, that can say this a cancer, this is a benign tumor. And that was part of the problem with the morcellator. Pat: So exactly what is a power morcellator? Dr. McLucas: As the name implies Pat, it’s an instrument that uses power to, out of a very small incision, take vey big bits of tissue, and it does it by having a spinning blade that will cut up the tissue. Pat: So it cuts it into morsels. Dr. McLucas: yeah, it morcellates it, yeah exactly it makes morsels out of it. But in that rare case, that rare case, where that tumor that you thought was benign is a cancer, the worry is that the morcellator might spread the disease and give you less of a survival rate afterwards. 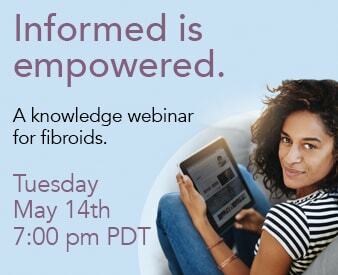 Pat: so once you find out that you do have fibroids then comes the question of what to do about it and what some of your treatment choices are and I know there are a number of them and I know that you’ve been really involved in fibroid embolization. Dr. McLucas: Well compared to the worry of the morcellator, and well talk more about the morcellator soon, fibroid embolization does not cut up any tissue. It basically starves the fibroids by blocking blood supply. Pat: So do they shrink up? Dr. McLucas: they shrink; one of patients said very well it’s like going from a grape to a raisin. And compared to myomectomies where you take out the fibroids, the fibroids after embolization never come back. So if you are a young woman, 25, and you’ve got fibroids, you have a myomectomy it’s not a good bet to say that’s going to be your only fibroid surgery. They will come back. Pat: That’s what happened with my sister. Dr. McLucas: There you go. Pat: She had to have two procedures done. And with a number of women that I have known, that you don’t deal with it once, this could return. Dr. McLucas: And with embolization there is no recurrence. Pat: And the morcellator is not used in embolization? Dr. McLucas: Fibroid embolization—no scalpels, no stitches, no morcellator for sure. We don’t cut up the uterus, we basically starve the fibroids, and it causes them to shrink, and I tell all my patients you’ll feel like you did maybe 5 years ago, and that’ll be enough to stop your symptoms. Pat: well that’s very good news. No morcellators at all so we don’t have to deal with that with fibroid embolization. Dr. McLucas: no scalpels, no sutures, no morcellators. yeah. Pat: Well we’ll continue this discussion. Thank you so much for watching.